“Are you looking at me?” This is a Lilac-breasted Roller. Photo taken in Botswana. 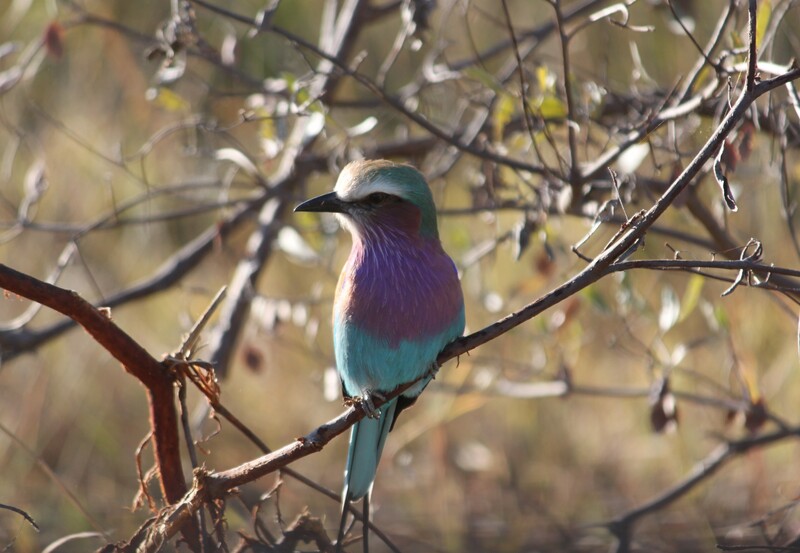 This entry was posted in Travel Photos and tagged 50 Year Project, Africa, Birds, Blog, Blogging, Botswana, Life, Lilac Breasted Roller, Nature, Photography, Travel, Travel Blog, Travel Journal, Travel Photo. Bookmark the permalink. I’ve never seen colors like that before on a bird! Gorgeous. Love the colors. What a great shot. He wants to know what we are doing and why. This might be the prettiest bird ever! It would look great in my sewing room. Love those colors. I had never seen such a colorful bird before. Beautiful picture, TBM! The Lilac-breasted Roller is so beautiful! I didn’t know that you had been to Botswana. How is it? I remembering having Bostswana stamps when I was younger and I remember them being very colourful with pictures of beautiful wild animals and birds. Botswana is amazing, Vishy. The landscape, the animals, and the people are mind-blowing. We spent a few days near Chobe National Park and a few days in the Okavango Delta. It is one of the countries that I think about a lot and I would love to go back. Just that other day I said to my partner, “I need to go back to Africa.” It’s hard to describe. Once you go it becomes a part of you. Isn’t he. I loved seeing him. Beautiful picture – what lovely coloring! beautiful photo! you see the best stuff!!! Hope you had a marvelous weekend! That is a beautiful bird! I think it beats out our Bluebird!! I must google to check out its size. Nice snap TBM! He’s tiny if memory serves correctly. Probably could sit on my palm. Me too. Such a sweet creature. This is a life list bird, for sure! Gorgeous. I hope you spot one. These Rollers are so beautiful… and so rewarding if one can capture them in flight… great photo..
Next time I’ll try to get one in flight. Do you have a photo of one in flight? Will have to look at your blog for some. the colors made me gasp. natures colors are so amazing. flowers, birds, moths and butterflies. no wonder man started wearing clothes, pretty dull in the greater scheme of things. That’s an interesting point about colorful clothing. All of my travels have taught me that nature is amazing. I’m always shocked by how impressive it is and I appreciate it more and more.